Dental implants are the only tooth replacements that chew and floss like normal teeth, while maintaining natural bone levels. Dental implants are the best available way to replace missing teeth. Unlike conventional bridges or dentures, crowns supported by dental implants maintain bone level, chew like normal teeth, and floss like them, too. 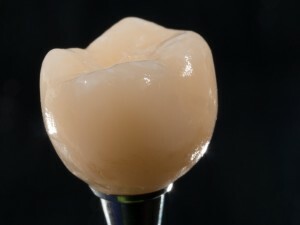 First placed by Dr. Brånemark in 1965, the root form dental implant has undergone substantial advancements in materials, manufacturing, surgical technique, and restorative options. Most of today’s implants are machined out of medical grade titanium, one of the most biocompatible, tissue friendly materials around. They are processed with special coatings to speed osseointegration–the healing of bone around dental implants. The osteocytes (bone cells) grow so intimately into the metal, it functionally becomes one with the jawbone. Because of that solid implant connection to bone, Dr. Le can attach crowns, bridges and dentures that bite, chew, and floss much more like natural teeth than ever before. And unlike human tooth structure, titanium is impervious to decay. 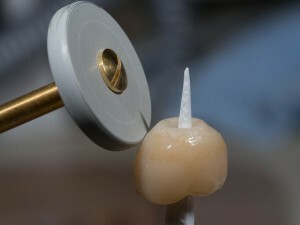 So while bridges and crowns may rot, implant-borne restorations have over a 95% success rate over 10 years. Most of our implant cases are to replace a single tooth. These are our favorite cases because they look, feel and floss just like natural teeth. The first step is screening: identifying a missing or failing tooth. Implants are the best option for empty spaces, but there are many good options to save teeth that must be ruled out first. This usually requires a visual exam and some x-rays. If you are a good candidate for implants, we refer you to an experienced specialist to further evaluate your case, and to place the implants surgically. For more and more cases, a 3D cone beam scan is taken, and your implant is placed virtually on a 3D model of your jawbone to verify the best possible positioning. After the healing process is complete, you return to our office for restoration. The total time for simple implant cases is 4 to 6 months from start to finish. We hand make many implant crowns right in our office with Cerec CAD CAM technology. One of the newest developments in our office is the arrival of CEREC CAD CAM technology. Select implant crown cases can be scanned, designed, and fabricated right in our office. If the parts are available, we can start and finish custom implant abutments and crowns in a matter of hours instead of weeks. Most of our patients come in for a quick impression scan, then come back in a couple of days. As with all implant dentistry, thorough pre-planning and advance arrangements are strongly recommended for the best experience. If your denture is loose, dental implants can be used to stabilize them. Denture cream or adhesive is just a stop-gap solution. Multiple implants can be strategically placed around your jaw to get your denture feeling tighter. Our office can create a custom package to include all the necessary procedures for a flat fee. The goal is to have your floppy denture become the most solid it can be, so you can enjoy more foods and encounter less social stigma. Financing arrangements are available so you can started immediately. For those who want the highest level of function and esthetics, we also offer full arch restorations supported by implants. These solutions give you the look, lustre and shine of natural teeth. More practically, our fixed solutions do not have to come out at night for cleaning or soaking. A lot of our patients simply do not want take their teeth our at night, or have their significant other see them without teeth. We can’t blame you. Dr. Le can help you design have the smile you’ve always wanted. We will custom design and custom build an affordable treatment plan for you.